A modern stylish single wall hung WC with dual outlet, transform your bathroom with one of our contemporary designer toilets from Roca's The Gap collection. Supplied with a quality soft close wrap over anti-bacterial seat. Manufactured by Roca using the best materials and production methods, this means products are more resistant, durable, easy to use and maintain. To be used with a WC Wall Mounting Fixing Frame (Sold Separately). 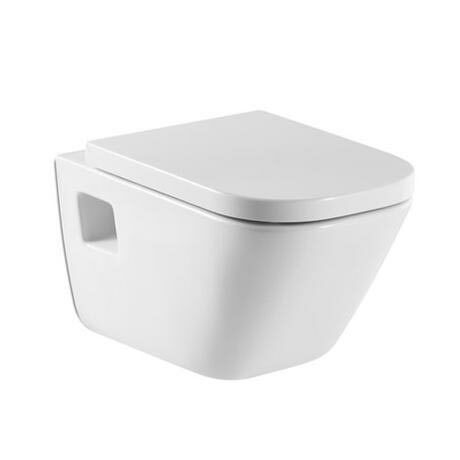 The stunning and innovative design of the Gap wall hung toilet pan makes it perfect for a bathroom lacking in space and looking to make the most of it. It is made from vitreous china making it strong and durable, and has been finished in a white gloss polish to give it a touch of style and class. The wall hung element is both aesthetically pleasing and functional, as it will mean cleaning around and under it will be much easier than with a pedestal toilet.